Add to the value of your home with beautiful hardwood flooring. Hardwood is a natural flooring option that comes in a variety of styles, colors, and plank sizes to choose from. Marett Carpet One Floor & Home in Volant, PA is your local hardwood dealer. Open up your space with hardwood flooring and make it feel warm and inviting to your guests. Hardwood floors are durable and can handle day-to-day activity, and can last a long time in your home when taken care of properly. We make finding the perfect hardwood floor for your home easy. Although hardwood requires an initial investment, it pays for itself over time. Homebuyers are willing to pay the price for real hardwood flooring in a home. Hardwood comes in a variety of styles, species, plank sizes and more for you to choose from. Add value and style to your home with new hardwood floors. Hardwood comes in a variety of styles, species, finishes, constructions and more. Different types of wood species will range in color, and even density and durability. Wood that is naturally hard like oak and maple are the ideal options for a family with an active lifestyle. There are two types of hardwood you can choose from, which is a solid or engineered construction. Both types of hardwood have great features and benefits, just one may be better suited for your home than the other. Solid hardwood flooring is seen as the traditional hardwood flooring option. It’s simple construction allows for the plank to show off the natural characteristics of hardwood wood. Solid hardwood features characteristics that no other flooring can replicate. Engineered hardwood flooring features a modern construction that is attractive to homeowners. These planks are made up of 3 to 7 layers of real wood veneers and topped with a premium piece of hardwood as the surface. This layered construction allows the planks to be more stable and resist wood’s natural tendencies. Hardwood flooring is known for being durable and long lasting, but it needs to be installed in certain areas of your home to live out its intended lifecyle. For example, solid hardwood can only be installed in on and above ground rooms like bedrooms, living rooms, and dining rooms. Due to its simple construction it is not build to handle heavy foot traffic. Engineered hardwood flooring can be installed in kitchens, hallways and even basements due to its durable construction. Be sure to keep hardwood flooring out of rooms with a lot of humidity and moisture like bathrooms and laundry rooms. As a member of the Carpet One Floor & Home cooperative, we have the ability to carry quality flooring at exceptional prices. 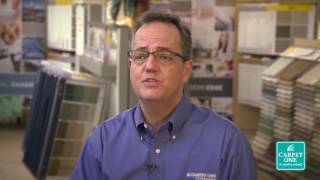 Your locally owned flooring source has the buying power of 1,000 stores combined so we can compete with the big box stores. Some of our exclusives include Rustic River™, Invincible™, and Voyager™. Be sure to visit our showroom to see our entire collection of hardwood flooring. When you take care of your hardwood floors, they will last for years in your home. As always, be sure to check with the manufacturers instruction’s when cleaning. Follow the link below to learn some tips on how to care for your hardwood floors. When it comes to choosing hardwood, there are a variety of styles. The most important decision is knowing is you need solid or engineered hardwood in your home. Follow the link below to learn more about each type and find out which would best work in your home.